Last weekend at their conference, The Monarch Butterfly NZ Trust formally announced that they’ve broadened their conservation efforts to include native moths and butterflies – a move that was welcomed by the NZ’s growing brethren of butterfly enthusiasts. 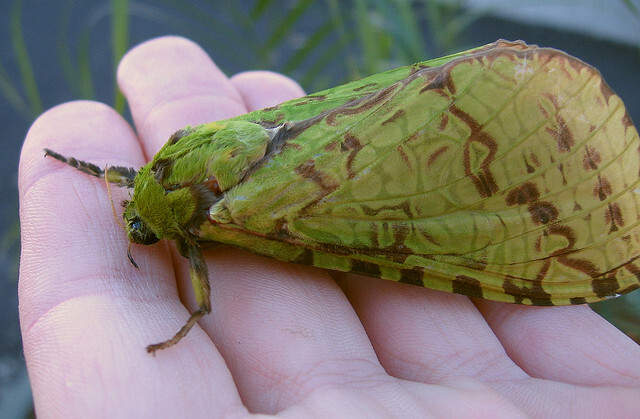 Our puriri moth’s bright green coat defies the definition of moths wearing drab colours. It has even been found to sport yellow and purple wings! Photo: Stefan Marks. The club began seven years ago to protect an overwintering site of the monarch butterfly in the Bay of Islands, however it blossomed with the help of an active online forum which provided planting guidance, pest control and tagging information to interested naturalists. Now, the newly named NZ Butterfly and Moth Trust uses the monarch butterfly as its flagship species to encourage this winged obsession. Monarch butterflies have been sighted in New Zealand since 1840 however they couldn’t establish here because their larval food-plant didn’t grow naturally here. So although monarchs attempted to colonise NZ across the Pacific from Mexico many times, their citizenship wasn’t cemented until people fell in love with them and imported various milkweeds including swanplant in 1870, so their young ones had something to feed on! They’re one of 12 vagrant species of butterflies that now call NZ home, bringing the total number of species up to 55 species. Seven of these migrants still cannot find a larval host-plant and introduction is unfeasible because our climate isn’t warm enough, so true NZ citizenship eludes them. By world standards 55 butterfly species may seem rather small, but given our temperate climate it’s to be expected. Instead, we’re rich in moths – at last count we had over 2000 species. And although it’s fixed in people’s minds that butterflies are day-flying, colourful creatures and moths are nocturnal, cupboard-dwellers, they really defy stereotyping. Indeed, many of our most famous moths – such as puriri moth – comes in bright green or yellow colours, while many others are day-flying and sport orange, yellow and red colouring. In fact, moths and butterflies exist on an evolutionary spectrum, from the most primitive moths with jaws, or no feeding parts to the most sophisticated moths which we call butterflies. Five super-families of butterflies exist and NZ hosts two of these families– admirals/ satyrines and blues/coppers. NZ entomologist, Brian Patrick and conference speaker describes our country as a “Land of Coppers” because this is our dominant species group. They are found everywhere from high-alpine areas to coastal turf with a different mix of species in every place. And although we’re not as butterfly mad as Japan – a country that has street names directing people to butterfly hotspots – gardeners are warming to the idea of wild gardens and butterfly husbandry. Many of the lectures at the conference stressed the fact that butterfly populations worldwide are dropping – something that will not be helped by climate change given that butterflies cannot easily migrate. • One Canterbury project has planted up several vineyards in host plants to increase the butterfly biodiversity and ultimately boost organic wine production. • In Auckland, the Monarch Butterfly Trust is working hard to raise funds for a classroom display and garden, so visiting schools can find some inspiration. • And throughout the US, researchers and conservationists have used prisoners to help mass rear butterflies to help endangered species , or research their migration routes. Given that butterfly husbandry is low maintenance, yet incredibly rewarding, it’s not surprising that these initiatives have been universally well-received. And now New Zealanders are not only nurturing monarch & red admiral pupae, they’re busy creating unkempt, wildlife-friendly gardens for our less glamorous moths and butterflies to thrive.